For something so familiar, music remains mysterious to many of us, to the point where our favorite musicians are more like magicians than everyday people. But the truth is, the world of music-making is closer to all of us than ever before. Sometimes all that separates us from realizing the potential of our own musical creativity is a little extra know-how. 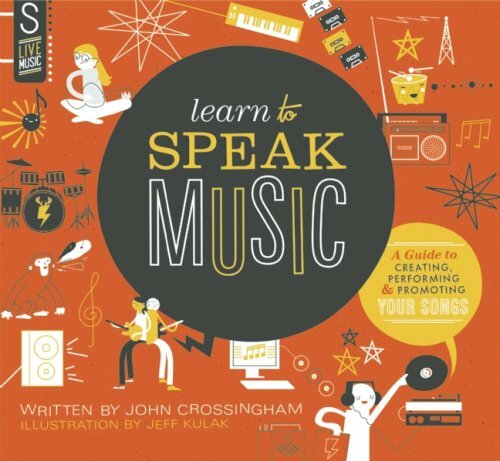 Learn to Speak Music helps kids learn the simplicity of this universal language by exposing every nook and cranny of how music is made â€” whether by the pros or by you! And itâ€™s about more than just picking up an instrument. From songwriting and artwork to shooting a video and setting up a practice space, every aspect of the world of popular music is explored. A long-time musician himself, writer John Crossingham uses his experience as a member of Juno award-winning collective Broken Social Scene to open doors normally closed. A vet of several world tours and many albums recorded both at home and in pro studios, heâ€™s also brought along the expert opinions of a cavalcade of other musicians including Feist, Buck 65, Metricâ€™s Emily Haines, and many more. Features include tips on buying your first instrument, getting the most out of your playing, setting up your own gig, hints for better songwriting, secrets of home recording, a guide to making your own video with MTVA-nominated director Christopher Mills, and much more! Whether for a seasoned young musician or merely the curious pop culture vulture, Learn to Speak Music is a chance for kids to see the world of music as never before.